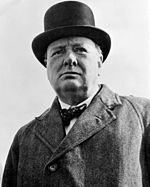 Winston Churchill dia mpanao politika, Mpanao gazety, mpanoratra ny tantaran'ny fiainany, mpanoratra, mpanoratra senariô teraka ny 30 Novambra 1874 ary maty ny 24 Janoary 1965. Loka Nobel ao 1953. I Lord Randolph Churchill no rainy. Ny vadiny dia Clementine Churchill, Baroness Spencer-Churchill. Ny zanany dia Randolph Churchill, Diana Churchill, Sarah Churchill, Mary Soames, Marigold Frances Churchill. Ny rahalahiny sy/na ny rahavaviny dia John Strange Spencer-Churchill. Voaova farany tamin'ny 29 Janoary 2018 amin'ny 07:26 ity pejy ity.